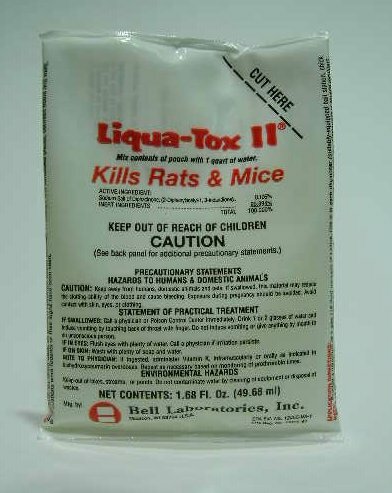 PRODUCT DESCRIPTION: Liquid poison concentrate which needs to be mixed with water and placed in bait stations. Works well where water is scarce or during droughts when rodents are actively seeking water. 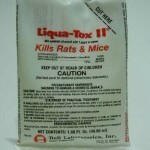 RATE OF APPLICATION: Mix one bag with one quart of water and set out in LIQUID BAIT STATIONS. Make sure to keep away from where children or pets may have access and be sure to inspect weekly to keep bait refreshed. Replace as needed. Here are links to the seed and Pecan Paste; you're already on the Liquatox page..
We live in the low hills in SW Reno, NV. California Ground Squirrels are a problem. Liquatox and Trappers Choice Pecan did the trick. I recommend calling the suppliers techs and discussing with them your problem. I found paper "Dixie Cups" cut down to about 1/2 inch tall works better than ziplock bags. It takes several days for the rodents to take the bait. @Benjamin Collins: We agree that using something like a cut down cup makes for a better feeding station compared to a zip lock bag. The key here to make sure there is little or no chance of contaminating the mixture. So for example, in areas where it might rain, the zip lock is usually the better option to insure the mixture doesn't get washed out. But if you're able to make safe, "open" placements, you'll almost always get faster results using something like a cut down drinking cup. Thanks for the feedback; its good to hear our products are working well!